Today's post is by the utterly adorable and always inspiring Audrey of This Little Street. Her eye for pretty color palettes and her contagious positive thinking never fail to amaze me. When we woke up last Saturday morning we had a beautiful fresh layer of snow covering every inch of New York City. The blizzard had moved on, and so we decided we should rally all of our warm clothes and go play with all that pretty white stuff. We came back home mid-afternoon, exhausted but happy, so we could rest. We were done. Or so I thought. As the sun was setting outside, my wee one (21-months old adorable but determined little redhead) asked me if we could go out for one more walk. "Again" she repeated over and over."Again". I hesitated - we had already had a busy day, and to be honest I was eyeing the couch, a bag of candy & the remote control to turn on my favorite show... but when she brought me her jacket and gloves with a big smile, I couldn't resist. We bundled up once more. And the minute we were out I realized how much I would have missed out if we hadn't stepped out of the apartment for one more walk. The light was perfect, everything wrapped in shades of white, pink and peach. It was so still and quiet - which, believe me, is a rare thing in New York City! We walked. We played. We made sure we used every single minute we had before sunset. So the thing is, what are you going to do today before the sun sets? How are you going to make today count? Written by Audrey of This Little Street. See more awesomeness on her blog. Aw, that is really cute:) And I love this collection as well! How wonderful would it be to have a room the color and feel of a tropical sunset? Also, feel free to send me that cake, although I think I would feel too bad to eat it. Lovely post Audrey! I pushed myself to go outside today and walked to 8th Street to get an incredible Asian Tui-na massage. I feel incredible both physically and mentally for doing something nice for myself and for stepping outside of my comfort zone! Aww this is sooo pretty!! :D I wish I had a view like that as well..
What beautiful images, I would have been satisfied with the eye candy, but a lovely story to go along as well? Thank you! Hi this blog always cheers me up when i'm feeling down. 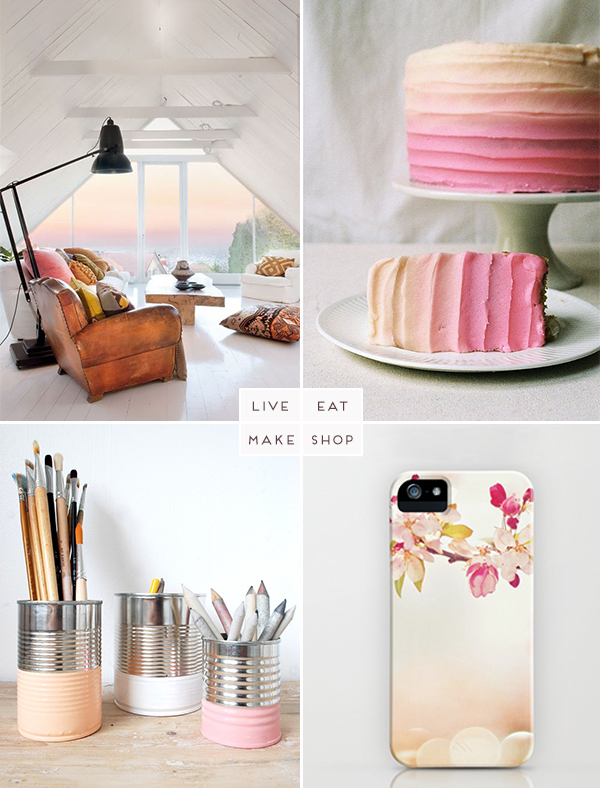 You always provide the best images and photos and I'm loving the pastel pictures here, especially the cake and iphone case - so pretty. What a happy and lovely post! And those images...gorgeous, wow. Lovely post Audrey! I pushed myself to go outside today and walked to 8th Street to get an incredible Asian Tui-na massage. I feel incredible qualifying for construction loan both physically and mentally for doing something nice for myself and for stepping outside of my comfort zone! Very amazing material, exactly what I needed.Terrific work! This is the kind of information that are designed to be allocated around the net.It's really an amazing and valuable portion of information "And, when you want something, all the universe conspires in helping you to achieve it." "And, when you want something, all the universe conspires in helping you to achieve it." tree pruning Bronx County I likes your article...really good info thanks to share with us your information.....(Y). I likes your article...really good info thanks to share with us your information.....(Y).I am pleased that you just allocated this valuable information with us. Please keep us recommended like this. Thanks for talking about. yes you are right....I really enjoyed reading your articles. I found this as an informative and interesting post, so i think it is very useful and knowledgeable. I would like to thank you for the effort you have made in writing. how,Use other parts of the body - If your leg is injured, try working out in a mortgage companies, lifting down payment on new Key safes arms to help you still move and increase your heart rate. how,Use other parts of the body - If your leg is injured, try working out in a home refinance lenders, lifting down payment on new Key safes arms to help you still move and increase your heart rate.